By Dan Crack Posted 19/04/2013 under General. 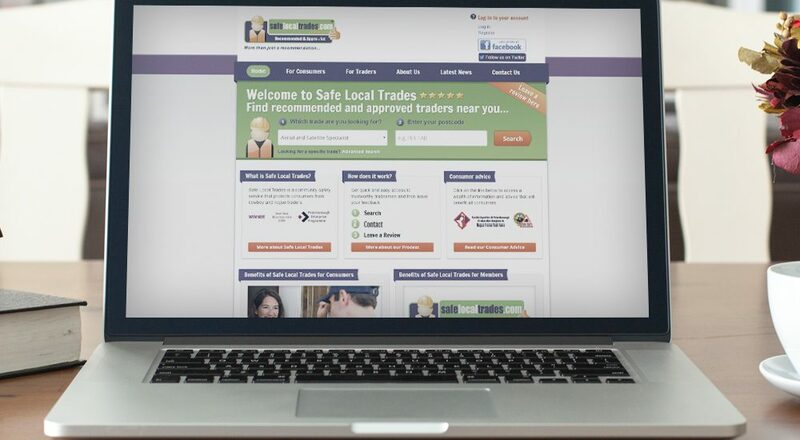 From recommended plumbers to painters – fencing contractors to fireplace installers – and everything in between, they are all available at the click of a button with Safe Local Trades. Hence the importance of a website that’s user-friendly for the consumer, and optimized for the trader. Safe Local Trades director Eileen Le Voi’s search for a company to re-write the website led her to Peterborough-based Free Thinking Design – following a recommendation from another of the creative company’s clients. The brief was to totally re-write the website, www.safelocaltrades.com – which was originally launched in 2008. The revamped website includes a series of new and enhanced features, and contains comprehensive local related consumer protection news and advice. Users of the service can now have their own Customer Area, where they can keep track of all interactions with members from the register, including viewing a list of their text messages, emails and reviews that have been left. The website also allows traditional business cards to be replaced with free online directory of the user’s favourite tradespeople. Eileen added: “From the outset I was extremely impressed with their approach to the project, they took the time to understand my business and were always looking for a solution to make life easier for me by automating as much as possible. “The team were a dream to work with. They made the whole project as pain-free as possible, and ensured the minimum of down-time on my part. “They were approachable and nothing was ever too much trouble. The fact that the Free Thinking Design office is based close to my own meant that I was able to pop in for a coffee and a chat about the website, and I particularly liked this informal approach.